CAFE (Coffee After Faith Experience) is our Young Adult Coffehouse designed specifically for 18-29 year olds. 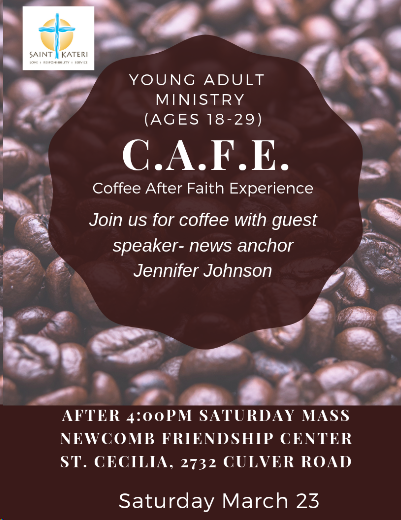 We invite young adults to gather together, enjoy some coffee and snacks, socialize, and listen to a guest speaker discuss their journey in life. CAFE is held after the 4 PM Mass at St. Cecilia, Newcomb Friendship Center (please come even if you can't make it to Mass - we start around 5 PM). Visit the Diocese of Rochester's Young Adult Page for other upcoming opportunities! Follow DOR on Social Media!